We too often pay lip service to failure as a positive life lesson when our child doesn’t make the team or she doesn’t get a good grade on a test or some goal we were reaching for didn’t happen. We’re full of platitudes and clichés about failure making us stronger. But do we really believe them? We can all agree that the sweetest victory is the one that’s most difficult to achieve, the one that required us to take a risk and to put everything we’ve got into it. And yet there are those times that even our strongest efforts fail and we pull back into our shells and don’t try again. That’s because we live in a society that doesn’t reward failure; we want everyone to be a winner, to get a trophy and recognition. Consider the plethora of trophies handed out to our children just for showing up. Since failure is not an option, how do we deal with it as a reality? Think back when you tried to master something difficult for the first time. Of course you didn’t get it right at first try and you probably needed time to figure it out, whether it was as basic as learning to drive a car or starting a business or learning a new job. 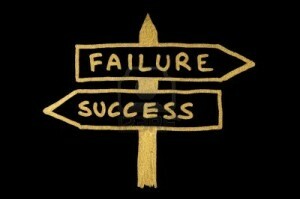 However, failure is all around us in ways we can accept and learn from. Just watch a championship sports team lose to a relatively unknown one and you see failure at its most emotional. How could those guys lose? And yet life goes on and there’s always another day, another match, another opportunity to be better, to train more and, yes, to win again. Sports teach us that failure is simply a part of reaching success. Athletes understand that best and use it to drive themselves that much harder toward achieving their goals. Is it any wonder then that we glorify sports heroes because they exemplify the ability to absorb failure to their advantage and to come out on top regardless? We can all name business leaders or politicians or sports figures or even someone in our community that overcame major disappointments and challenges to succeed later on. Just think of Steve Jobs who was fired by Apple, only to go out and reinvent himself and then come back to save Apple for the brink of bankruptcy. Or the young soldiers who come back to us with terrible war injuries and who inspire us with their determination and courage to live a normal life in spite of their trauma. For them, the struggles and challenges they face are simply a point in time on the road to where they’re headed. Perhaps we worry too much about failure to the point that we become indecisive and fearful of taking a risk. You don’t have to be a star athlete or business guru to be a winner in life. Whether it’s taking a night class in order to get a better job or letting yourself trust another person to build a stronger relationship, the choice is yours and failure is always a possibility. But the rewards can be that much sweeter.